Update October 2018: Updated a new version of the BlueDV AMBE for Android version. Better screen support and PTT support. Update 24 jun 2018: Some issues with adding OTG on some devices. I am investigating this issue. Sometimes I work on projects that never reached a final but fun to test with.. They will end up in the garage page. Try it… It’s free but no support. 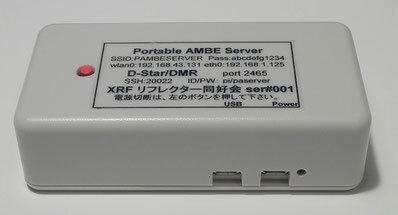 You connect the AMBE3000 to your Windows PC and start BlueDV AMBE Server. Then you start the BlueDV AMBE on your Android device and connect it over WIFI/4G to your PC. Now you can make a DSTAR or DMR QSO with your Android device. So you talk and listen to your phone and not a radio. Install and run the BlueDV AMBE Server on a Windows 7 or 10 machine. Select the Serial port and correct baud rate. Press start and the AMBE3000 hardware will appear. If not.. Then you selected the wrong COM poort or used the wrong baud rate. Check the ip address of your Windows PC that is running the BlueDV AMBEServer. Now start BlueDV AMBE and go to setup. Enter your call and enter your Windows PC IP address at “AMBEServ IP”. Now you can connect to the AMBE Server by pressing the connect button. Now you can make DSTAR and DMR QSO’s and talk to your phone or tablet. 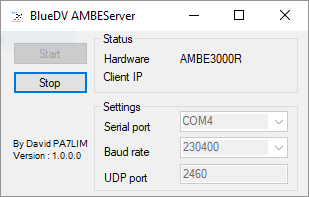 If you already have an AMBEServer running on Linux, you can connect the BlueDV AMBE for Android to your existing AMBEServer. See https://nw-digital-radio.groups.io/g/ambe/topics for more information. Nice documents in French about setting up AMBEServer on Linux.